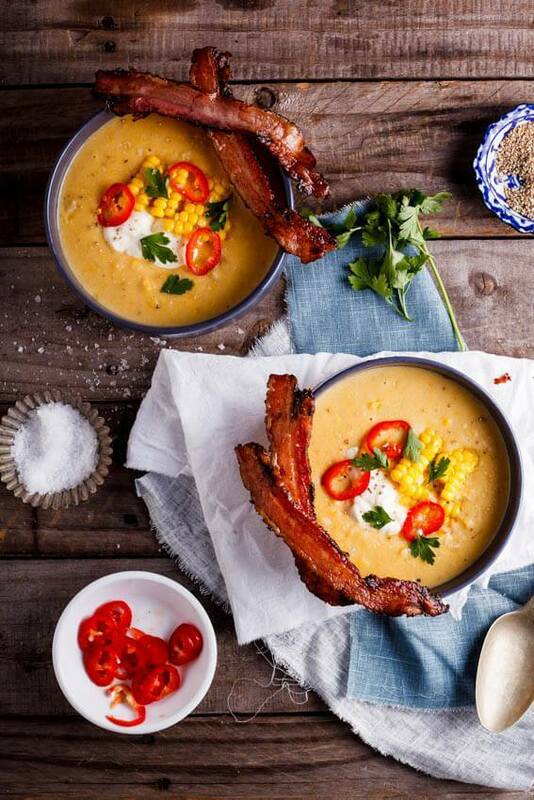 Creamy corn chowder served with crispy bacon dippers is like sunshine in a bowl. And dipping crispy bacon into it? Yes please! Boil the shucked corn in a large pot of water until cooked. Remove the corn then cut off the kernels. Set the kernels aside and return the corn cobs to the pot of water with the onion, bay leaves, peppercorns and salt. Allow to simmer and reduce for 30 minutes then drain and set aside. Return the pot to the heat then melt the butter over medium heat. Add the onion and garlic and allow to sauté for 5 minutes. Add the potatoes and corn and sauté for a further 10 minutes before adding the corn stock. Allow the chowder to simmer gently for 20 minutes or until the potatoes are cooked through. Add the milk, lemon juice and season to taste. Transfer half of the chowder to a blender and blend until smooth. If you prefer, you can strain this mixture back in the pot but I don't mind the texture of the blended chowder so I omit this step. Pour the blended chowder back into the pot with the remaining soup then check the seasoning and adjust. Serve the chowder topped with a dollop of sour cream, parsley and chili (if using) and serve with crispy bacon dippers.